Finding a place that serves anything specifically veggie--burgers, meat substitutes, etc.--is a real treat, so imagine my delight to find a restaurant that serves veggie hot dogs! 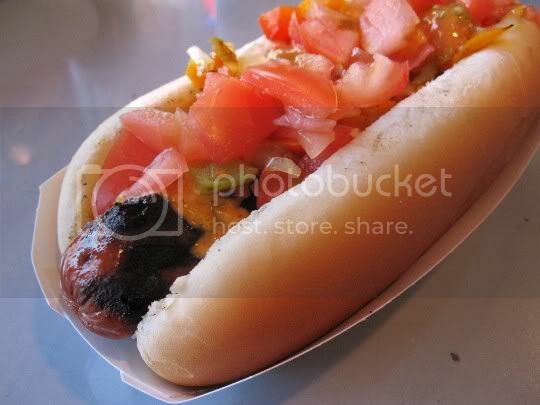 I've been lucky enough to enjoy a nice veggie dog with all the fixings (mustard, ketchup, onions, relish) at places like Dodger Stadium and other various restaurants through Los Angeles, but Vicious Dogs has SIX different veggie dog offerings that it makes it one of my top picks! It's a bit of a drive for me (coming from West LA) to go to North Hollywood, but the food and service make it well worth the trip. Don't worry meat-eaters, Vicious has "regular" dogs/links/sausages on the menu, so everyone can enjoy. 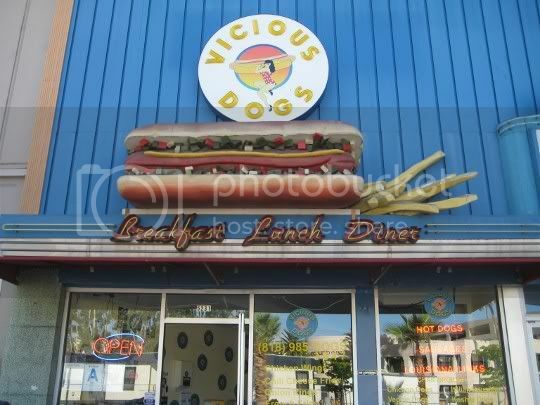 There are some veggie sides offered--mozzarella sticks, jalapeno poppers, fries, onion rings, potato salad--but they're only so so...go to Vicious for the dogs! Not to mention the delicious line of Calypso bottled lemonades they carry, in flavors like black cherry, mango, lime, kiwi, and more. Lemonade and hot dogs...there's nothing like it! And for relatively low prices, I make it a point to visit at least a couple times a month! This is your standard Vicious Dogs veggie dog: a charbroiled dog on a steamed bun (yes, they steam their buns!). 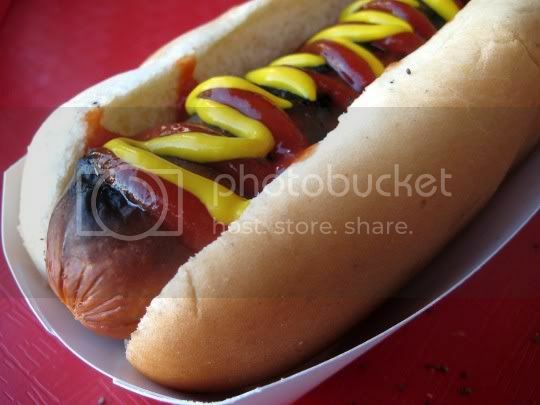 The dog has that roasted, smoky, grilled flavor, nestled inside a warm, moist, chewy bun. Top with anything: ketchup, mustard, barbecue sauce, relish, onions, kraut, grilled onions...you name it and they've probably got it. Ay carumba! A combination of grilled onions and red and yellow sweet peppers, chopped tomatoes, and chipotle sauce top this grilled dog. The onions and peppers have a wonderful smoky flavor, although the tomatoes didn't have much flavor. I'm guessing they were underripe, and unfortunately, the tanginess of a nice RIPE tomato is exactly what was missing. The chipotle sauce, which was sort of like a spicy mayo, was good, rich, and creamy...but I still thought there was something missing: salt! I did like this dog, but it just didn't quite have enough flavor. Mustard probably could have helped. This is definitely one of my favorite dogs here. 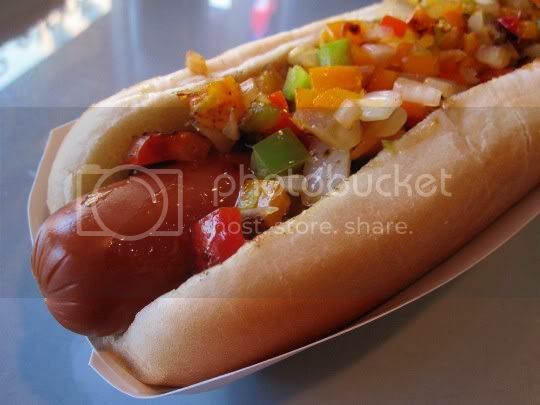 A mix of grilled onions and sweet peppers top a steamed dog, which is then slathered with a sweet and spicy chili glaze. Yum! It has a bit of an Asian flair, and the juicy peppers are so good with the sweet sauce. 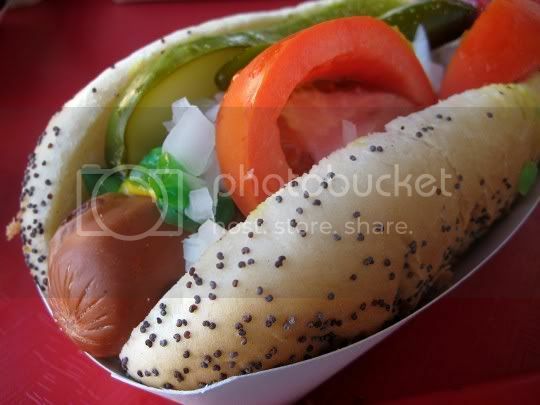 This hearty dog needs no other condiments added to it, just enjoy the delicious sweet-spicy flavors. I was a little wary to try a Chicago-style dog with all that stuff on it: thick wedges of tomato, a pickle spear, pickled peppers, mustard, onions, and neon green relish. A sprinkling of celery salt plus a steamed poppy seed bun complete this mouthful of a meal, and when I say mouthful I'm not kidding. Open wide for your first bite! Then, experience the unusual but strangely appetizing combination of salty, tangy, spicy, juicy, and smoky. Soooo good! I was full after one of these, and for good reason. This is a lot of food! I think the bun was a little overwhelmed at all its fillings, as it started to split about halfway through. But oh well, this messy masterpiece is a sure winner. Eat here again? No question about it, this is already a staple monthly trip. Too bad they're closed on Sundays, and only open until 8 pm during the week. Metered street parking only, but they accept credit cards, yay! I live like a mile from here! I finally tried this place out about a month or so ago. It was good! I got a Cheese Dog. The cheese was quite spicy! It's good to know I have a place just around the corner for hot dogs. Also got a cupcake from the place they share a space with. Pretty great.